After getting wet trying to sketch downtown I bussed over to SAM and did this sketch of Aphrodite's Torso. 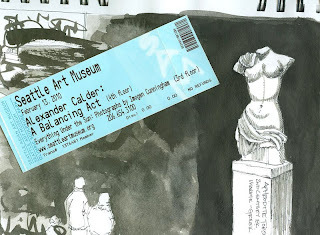 It was the Urban Sketchers assignment this week - Museums. Time has been tough on Aphrodite, she's chipped, cracked and missing all limbs but still in better shape than I am and I haven't been around since the 2nd century B.C. (although it feels like it). This is great! Did they actually let you sketch inside. I would love to do that. Gail, security came around a few times but didn't say anything. The ink wash was done outside of SAM - I'm sure that would have been a red flag activity. Always easier to get forgiveness than permission! I'm told some exhibits are drawable, none are paintable, some we're not allowed to even draw. Very nice!! Glad you found this particular shelter from the weather!